Start by bring a large pot of water to a boil and add salt. Cook the box of jumbo shells as directed. It should make more than 21 shells but that’s okay. It’s good to have extra in case some break. Strain the shells, rinse with cold water and set aside. Next make the cashew cheese by draining and rinsing the cashews. Transfer them to a blender or a food processor, add the lemon juice and one teaspoon of salt. Blend on high until smooth with a texture similar to ricotta cheese. You may need to use a spatula to scrape down the sides in between blending. Spoon the cashew cheese out into a large bowl and set aside. Once the frozen spinach has defrosted, place it in a strainer. Fold a few paper towels together and use them to press on top of the spinach so that the excess water strains out of the bottom. Repeat this step until the spinach is mostly dry. Add it to the bowl with cashew cheese along with the dried herbs, minced garlic and a dash of salt & pepper then stir everything together until well-combined. Preheat the oven to 350°F and pour 1/2 of the jar of marinara over the bottom of a 9 x 13” baking dish. 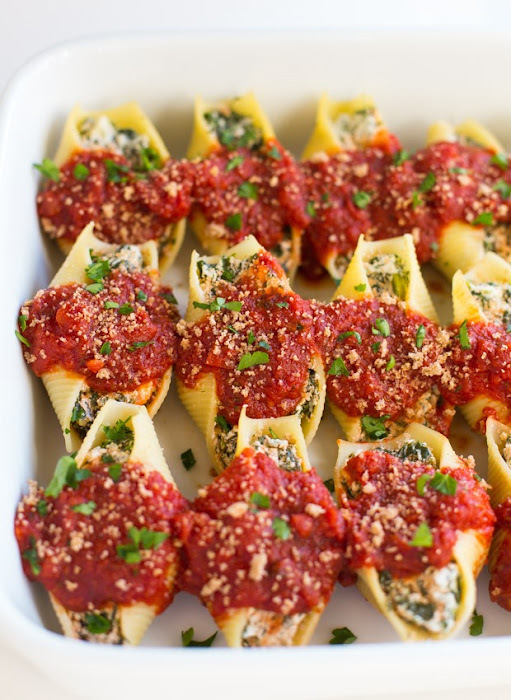 Using a spoon, scoop the cashew spinach mixture into each shell and arrange them in the baking dish. Spoon the remaining marinara on top and sprinkle with panko breadcrumbs, then cover the baking dish with foil and bake in the oven for 35 minutes. Allow to cool for a few minutes before serving. Top with fresh parsley, serve warm and enjoy! Store leftovers in an airtight container for up to four days or freeze before baking for up to one month.